Arizona quarters were launched into circulation yesterday with the United States Mint release ceremony on the lawn of the state Capital in Phoenix. "Children make up a good portion of the 147 million Americans plugging the coins into their commemorative folios or folders. This has educated a whole generation of Americans in geography and history." The Arizona state quarter is strikingly attractive with its Grand Canyon and saguaro cactus design theme. Over 4,200 quarter design suggestions from across the state were sent to the 24-member Arizona State Quarter Commission appointed by Governor Janet Napolitano. From those, five designs rendered were created by United States Mint artists, and the final one selected as the template for some 500 million minted Arizona quarters. Moy said the design illustrates the state’s natural beauty. 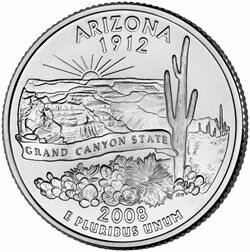 "That’s why we think the Arizona state quarter will be one of the more popular ones, because of that natural-beauty factor. There is a whole segment of people who get excited about naturally occurring things that are unique to each state." 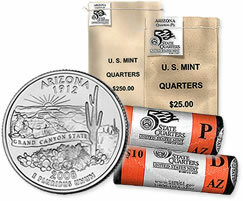 For coin collectors and those unwilling to wait for the quarters to make their way into banks and local stores, Arizona quarters may be purchased directly from the Mint. Two-roll sets for $32.95. One 40-coin roll is from the Mint facility at Philadelphia with coins bearing “P” mintmarks while the other roll is from Denver with “D” mintmarks. $25 Dollar Bags with 100 coins for $32.95. $250 Dollar Bags with 1,000 coins for $309.95. Orders may also be placed using the Mint’s toll free line, 1-800-USA-MINT (872-6468). The Alaska state quarter is next in line for release this year followed by Hawaii.